In July, when the national media was gazing at the Dalit upsurge in Gujarat’s Una, another episode occurred in a north Bihar village, Babu tola-Matthiya, in Muzaffarpur district’s Paroo area. Two Dalit youth allegedly attempted to steal a Bhumihar’s motorcycle. The Dalits were thrashed and urinated upon. The Paroo police arrested two of the 11 accused and an inquiry established the thrashing, but not the urinating charge. Opposition parties in Bihar attacked the Nitish Kumar regime on the issue. Union Minister Ram Vilas Paswan visited the Dalit youth. Even though Bharatiya Janata Party Leader of the Opposition Sushil Modi attacked Nitish Kumar, Union Minister Giriraj Singh, a Bhumihar leader, conspicuously stayed silent on the issue. Many thought there would be a huge Dalit mobilisation that would merge with the fierce Dalit upsurge in Gujarat led by Jignesh Mewani. Some political observers recalled 1974-1975 when the Navnirman Andolan in Gujarat almost coincided with the Jayaprakash Narayan-led Sampoorna Kranti (Total Revolution) movement which eventually forced then prime minister Indira Gandhi to impose a state of Emergency. But the politics around the Paroo incident petered out. Why? Because the atrocity could not be articulated as a Dalit versus Savarna Hindus issue. It merely remained a Paswan versus Bhumihar dispute. In Bihar, the Dalits are not a consolidated socio-political constituency. Within the 23 Dalit castes, a certain degree of resentment exists against the Paswan (Dusadh) hegemony. The 22 other Dalit communities are categorised as Mahadalits. Even within the Mahadalits, there are four communities — the Chamars (Ravidas), Pasi, Dhobi and Musahar, who are perceived to dominate the rest. This kind of multi-layered stratification is an obstacle to the emergence of consolidated Dalit politics in Bihar. Muzaffarpur is also known for political rivalry between the Bhumihars and the Rajputs. Quite often, this rivalry becomes intense during elections, except on some occasions of polarisation along the lines of caste (backward-forward) or religion (Hindu-Muslim). Another explanation is that the Dalits don’t have enough of a middle class population to launch and sustain an agitation, nor do they have any notable intelligentsia to articulate and disseminate their issues. The Dalits are about 15 per cent of Bihar’s population, but form 34 per cent of the state’s farm labourers. Nearly 70 per cent of Dalits live below the poverty line. Out of the 11 assembly seats in Muzaffarpur district, Bochahan and Sakra are reserved for the Dalits. Both seats are located in western Muzaffarpur whereas Paroo is in eastern Muzaffarpur. In the 2015 assembly election, Kanti, an adjacent assembly seat, was won by Ashok Chaudhry, an Independent Dalit candidate who replaced the Bhumihar incumbent. Kanti is a Bhumihar stronghold, though at least twice — in 1995 and 2000 — Pasmanda Muslims have represented it in the assembly. Paroo is supposed to be a Rajput and Bhumihar stronghold. Most times candidates from these two castes have been elected here. The only time a Dalit was elected was when the seat was reserved. A Dalit wresting the unreserved Kanti seat created some heartburn among the Bhumihars. Some local observers feel this was an indirect factor in the Bhumihar-Dalit conflict in Paroo. In the 1980s, Gail Omvedt, a veteran commentator on Dalit politics, in her book Dalit Vision, noted that V P Singh and his political lieutenant Ram Vilas Paswan, ‘fairly smothered the presence of independent Dalit leaders and movements,’ whereas in the 1990s, the bulk of the Dalits remained with Lalu Yadav. In the Lalu-Rabri Devi era, the Bochahan and Sakra MLAs were counted as Dalit leaders. But Lalu kept changing the candidates in Sakra every election. These candidates were handpicked by Lalu, mostly from among Dalit teachers in Muzaffarpur’s Lohia College. These leaders imposed upon the Dalits from above could never create their own mass base. Shyam Rajak, who emerged as an articulate and sharp leader in the Lalu-Rabri era, later switched allegiance to Nitish Kumar’s Janata Dal-United. After Lalu joined the Nitish alliance last year, he ensured that Rajak was sidelined. Ram Vilas Paswan’s son Chirag Paswan seems to have lost even before he emerged as a leader, unable to connect with Dalits in Bihar. Paswan’s Lok Janshakti Party, like most regional parties, is busy perpetuating dynasty, rather than pursuing meaningful politics. 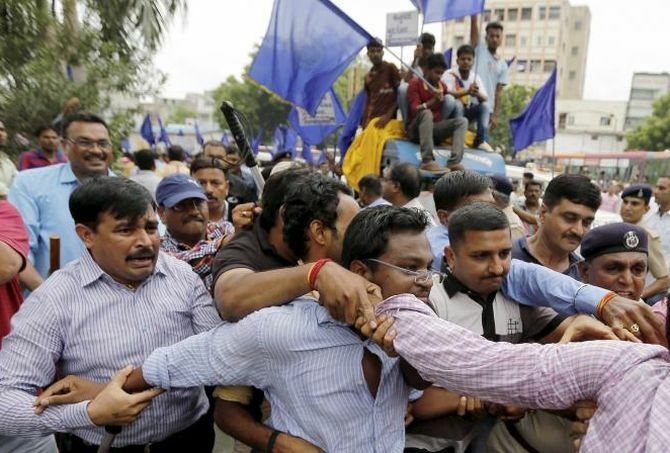 Economically backward Bihar has to wait longer for the emergence of a definite Dalit middle class, the emergence of a Dalit intelligentsia, a Dalit leadership, and a support base to launch and sustain a popular Dalit movement. Small wonder then that the Paroo incident failed to become the Una of Bihar. Mohammad Sajjad, associate professor, Centre of Advanced Study in History, Aligarh Muslim University, is the author of Muslim Politics in Bihar: Changing Contours (Routledge, 2014) and Contesting Colonialism and Separatism: Muslims of Muzaffarpur (Primus, 2014).